Playa del Carmen is located along the Great Mayan Reef and has access to some of the most impressive dive sites in the Mexican Caribbean. 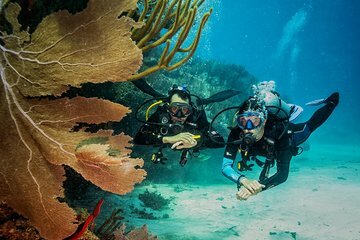 This tour maximizes your chances of marine sightings with two thrilling scuba dives at two equally spectacular destinations. Accompanied by a PADI divemaster, dive up to depths of 45 feet (14 m), admire the stunning corals, and look out for angel fish, moray eels, and sea turtles.